Butler Cabin is the name of one of the many landmarks at Augusta National Golf Club, home of The Masters Tournament. Golf fans know it as the place from which the post-tournament interview with the winner takes place. But not much is know about it to outsiders. So let's go over some of the Butler Cabin details. 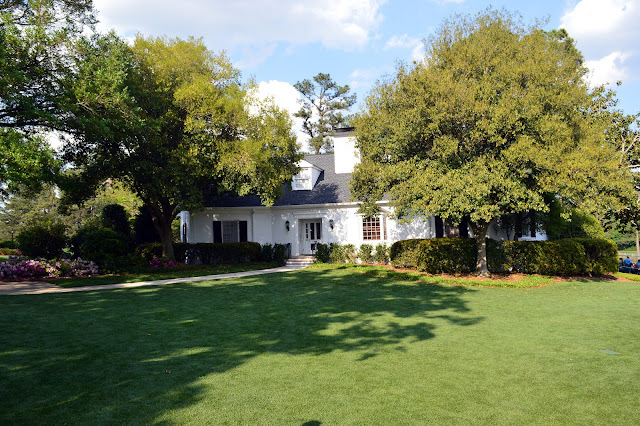 First, it's a house built for lodging by Augusta National in 1964. Aside from that interview with the winner and other television interviews conducted during the tournament, the Butler Cabin is rarely seen. But it is close to the main clubhouse and the par-3 course (in fact, it sits off to the left to the 10th tee). The cabin has a very well-manicured and maintained grass lawn with hedges and flowers. A wide sidewalk leads to the front door. It has a white exterior with dark shutters, a gabled roof and a roofline that includes a white chimney and two dormer windows. Jack Nicklaus was the first Masters winner, in 1965, whose post-victory interview was conducted inside Butler Cabin. Who Is Butler Cabin Named After? The namesake of Butler Cabin is Thomas B. Butler (the "B" is for Baldwin), a former Augusta National club member. Baldwin, like many (but not all) Augusta members, was filthy rich. A Baltimore, Maryland, resident, Butler was chairman of Mercantile Bank and Trust, which at one time was the largest bank in Maryland. He was also heavy into railroad stocks through his bank. Butler was a personal friend of President Dwight Eisenhower, another Augusta National member, and was a frequent playing partner of the president at the club. What Does the Butler Cabin Look Like Inside? Aside from the basement (more on that in a minute), nothing is ever seen of the Butler Cabin interior. Augusta National Golf Club is known for guarding its secrets. The Butler Cabin, though, is a residence: It has multiple bedrooms and bathrooms and a kitchen. What the specifics of those arrangements are, the numbers, the square footage, is not known. Public information is exceedingly rare — no Augusta member or guest wants to be the one to reveal anything because that would almost certainly lead to their banishment from the club. During the 51 other weeks of the year, the non-Masters weeks, how does the club use Butler Cabin? Like the other nine cabins on the club grounds, Butler Cabin is used for lodging by club members or guests of members. That lodging is not free, however. But it doesn't cost much to stay there — about what a nice (but not a fancy or a Downtown) hotel would charge. More than $100 per night, but (it's believed) less than $200. Guests of members pay nothing, but the cost of the lodging is added to the member's annual bill. Butler Cabin was built in 1964, and the 1965 Masters is the first time it was used as a broadcast headquarters by CBS Television. The network's hosts conduct interviews throughout the week from the cabin. At the conclusion of the tournament, the winner, last year's winner, and the low amateur (if any amateur makes the cut) appear on the network set. Briefly, the winner answers a few questions. 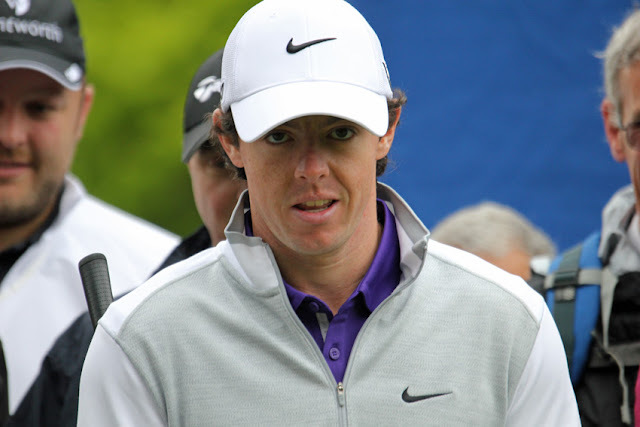 Then last year's champ puts the Green Jacket on the new winner. All that takes place in the Butler Cabin basement (or "lower level," as the club surely prefers). In fact, that lower level was specifically built to provide a space for CBS' Masters hosting and interview duties. Prior to construction of Butler Cabin, those interviews took place in the bedroom of the residence of Augusta National co-founder Clifford Roberts (inside what is now called the Roberts Cabin). The Butler Cabin basement was therefore built as a large, open space — there's not much down there. The area accomodates cameras, cables, lights, electronics and plenty of people during Masters Tournament week. At one end is a fireplace (a portrait of Bobby Jones hangs above it) that serves as the backdrop for interviews. The rest of the year the lower level is essentially a living room — plenty of seating and a large television on the wall for guests.